ORAPA, Botswana (CNN) -- The world's largest open-pit diamond mine is as big as 52 football fields and more than 20 stories deep. From top to bottom, it's a winding road of perfectly terraced steps making it look like a giant hand has taken a slice out of the earth. Huge tractors and bulldozers busily tear into the earth's crust while equally huge trucks haul the rich earth out of the crater. The soil is taken to a facility where it is crushed and washed and crushed again until diamonds finally reveal themselves. The diamond business and the country of Botswana are booming. Since the discovery of diamonds in 1967, it has been nearly 40 years of constant growth for this model of democracy in Africa. Botswana boasts one of the highest per capita incomes on the continent, more than $4,000. The income is 10 times the per capita income when Botswana gained its independence from Britain in 1966, according to Botswana officials. "Our former leaders were visionaries," said Education Minister Jacob Dicky Nkate. "They insisted that after the discovery of diamonds, every single Batswana be entitled to a free education from first grade to a doctorate degree free of charge. How many democracies can boast that achievement?" Education isn't the only service that is free. Health care, a growing concern in Botswana, is also paid for by the government. Lifetime supplies of anti-retrovirals for AIDS sufferers are a novelty in Africa and vital in a nation where experts estimate that two out of every three people are infected with the HIV virus. But if it wasn't for diamonds, Botswana -- which is landlocked in southern Africa -- would still be just a cattle outpost in the bush, Nkate said. That would be a difficult life in a country that is about the size of Texas and has only about 10 square kilometers of irrigated land. In a deal that may have seemed a little unfair in 1969, the government of Botswana signed a 50-50 deal with De Beers, the global diamond giant, to explore and mine all of the country's diamonds. As a result, the nation's economy has quadrupled in the last four decades and it boasts the highest standard of living on the continent. 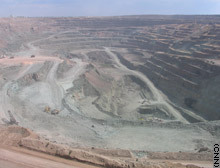 The joint venture, Debswana, boasts annual profits in the billions of dollars and has made diamonds Botswana's single largest source of foreign exchange, accounting for more than 75 percent of the country's GDP. Botswana draws much of its income from the sacks and sacks of diamonds mined from the Orapa Mine in the country's northeast to the Botswana Diamond Valuing Company sorting facility in the capital, Gaborone. In the sorting facility, 10 floors are filled with tables laden with diamonds of every shape and size that will be sorted, graded and certified before being shipped to the De Beers diamond center in London, England. "This is the nerve center of Botswana's diamond industry," said production manager Mike Moremong, who has worked here since the company started in 1978. "We're lucky to have a population that understands that all diamonds that are mined here are for the people and not for a few individuals." Moremong and others don't want to cite examples of African nations where diamond profits end up in the pockets of the privileged few. In Botswana, everything is shared equally. Employees sift through millions of dollars worth of diamonds with minimum security presence. There are closed-circuit cameras but everyone goes about their business as though they were sifting coffee beans and not precious stones. "Trust is key here," Moremong continued. "Without trust, our economy would crumble and our country would be another failed African state." Moremong said he is proud that none of Botswana's diamonds can be classified as conflict or blood diamonds. "Every diamond that comes out of the ground in Botswana can be traced from the mines until it gets to De Beers in London," he said. The country's attorney general, Athaliah Molokomme, said the diamond deal has been Botswana's best friend. "De Beers has been good to us and this private public partnership has proved to be a win-win situation," she says, adding that she would not seek any changes if the deal were to be renegotiated. Botswana, which has never experienced war or civil strife since its independence, is the exception rather than the rule in Africa at least when it comes to stable governments and again, the education minister insists, it's because of foresight. "It all boils down to leadership," Nkate said. "Leadership and education. Without these two, nothing can be achieved when it comes to a country's growth and development." The Orapa Mine produced nearly 15 million carats in 2005, according to the Debswana Web site.